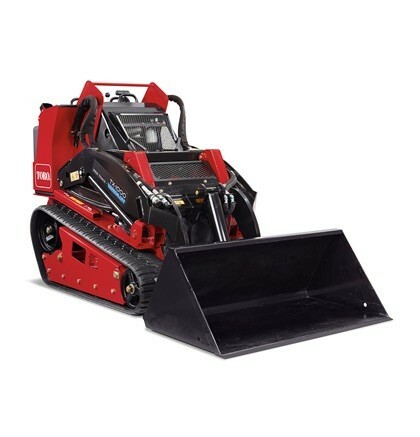 Designed with vertical lift loader arms, its 487.6 kg rated operating capacity delivers category-crushing performance that’s an industry game-changer. The TX 1000 wide track also offers increased reach at full height for maximum jobsite productivity. And speaking of productivity, an 206 cm hinge pin height allows the arms to clear the side of a 23 m² dumpster or 1000 kg truck. This lightweight, manoeuvrable machine packs unmatched strength and reach in a compact package for the ultimate working advantage. Toro exclusive vertical lift loader arms increases load capacity and greater reach at full height deliver even stronger performance. 206 cm hinge pin height allows attachments to easily clear the side of 23 m² dumpsters or 1,000 kg trucks. Rated operating capacity 487.6 kg allows the TX 1000 to lift more than any compact utility loader on the market. Endless Kevlar® reinforced tracks ensure maximum strength and durability. It’s ideal for the demands of any jobsite to outperform on any surface, even sand or loose gravel. Maximum manoeuvrability on uneven surfaces. Exclusive patent-pending traction control design is intuitive, easy to operate, and effortless. Dedicated operating platform with thigh and hip padding for increased operator comfort. Suspended platform has clear line of sight to the attachment plate, machine and jobsite for maximum visibility.